Photovoltaic markets can be classified based on the end-use application of the technology. The most common PV projects are off-grid applications. Water pumping also represents an important application of PV, particularly in developing countries. The largest long-term market potential for PV, in volume of sales, is with on-grid applications. In grid-connected applications, also called “On-grid” applications, the PV system feeds electrical energy directly into the electric utility grid (this includes central-grids and isolatedgrids). Two application types can be distinguished, distributed and central power plant generation. An example of a distributed grid-connected application is building integrated PV for individual residences or commercial buildings. The system size for residences is typically in the 2 to 4 kWp range. For commercial buildings, the system size can range up to 100 kWp or more. Batteries are not necessary when the system is grid-connected. Another application is the installation of “PV generators” by utilities at power substations and “end-of-line” sites. These applications can be on the threshold of cost competitiveness for PV, depending on location. For example, the Sacramento Municipal Utility District (SMUD) in California has been implementing a plan to install more than 1 MWp per year of distributed PV in its service area. Distributed grid-connected PV systems and a central PV power plant are shown in Figure 1, which is adapted from Ross and Royer (1999). The benefits of grid-connected PV power generation are generally evaluated based on its potential to reduce costs for energy production and generator capacity, as well as its environmental benefits. For distributed generation, the electric generators (PV or other) are located at or near the site of electrical consumption. This helps reduce both energy (kWh) and capacity (kW) losses in the utility distribution network. In addition, the utility can avoid or delay upgrades to the transmission and distribution network where the average daily output of the PV system corresponds with the utility’s peak demand period (e.g. afternoon peak demand during summer months due to air conditioning loads) as described in Leng and Martin (1994). PV manufacturers are also developing PV modules which can be incorporated into buildings as standard building components such as roofing tiles and curtain walls. This helps reduce the relative cost of the PV power system by the cost of the conventional building materials, and allows the utility and/or building owner to capture distributed generation benefits. The use of PV in the built environment is expanding with demonstration projects in industrialised countries. Central generation applications are not currently cost-competitive for PV. Several multimegawatt central generation systems have however been installed as demonstration projects, designed to help utilities acquire experience in the management of central PV power plants. 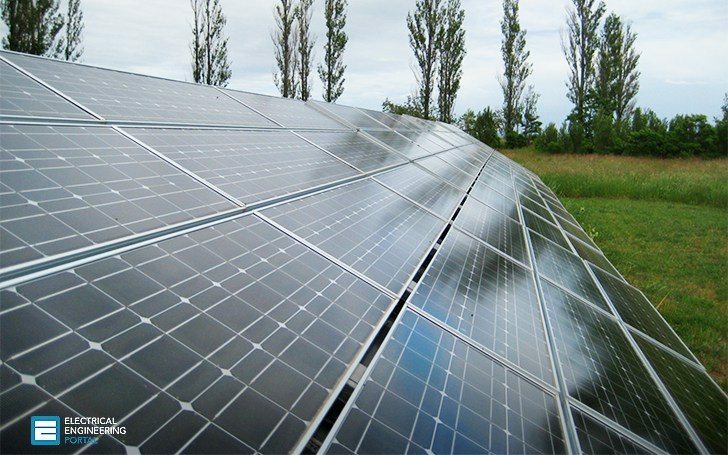 Installations of central PV generation, like distributed grid connected PV, represent a long-term strategy by governments and utilities to support the development of PV as a clean energy with a guaranteed fuel supply. Currently, PV is most competitive in isolated sites, away from the electric grid and requiring relatively small amounts of power, typically less than 10 kWp. In these off-grid applications, PV is frequently used in the charging of batteries, thus storing the electrical energy produced by the modules and providing the user with electrical energy on demand. The key competitive arena for PV in remote off-grid power applications is against electric grid extension; primary (disposable) batteries; or diesel, gasoline and thermoelectric generators. The cost of grid extension in the US, estimated by the Utility Photovoltaic Group (UPVG) ranges from $20,000 to $80,000 per mile. Thus, PV competes particularly well against grid extension for small loads, far from the utility grid. Compared to fossil fuel generators and primary batteries, the key advantage of PV is the reduction in operation, maintenance and replacement costs; these often result in lower life-cycle costs for PV systems. Off-grid applications include both stand-alone systems, as shown in Figure 2; and hybrid systems, which are similar to stand-alone systems but also include a fossil fuel generator to meet some of the load requirements and provide higher reliability, as shown in Figure 3. Photovoltaic water pumping is one of the most common PV applications around the world, with thousands of photovoltaic powered water pumps installed both in industrialised and developing nations. Typical PV water pumping applications include domestic water, water for campgrounds, irrigation, village water supplies and livestock watering. PV pumps are increasingly used for intermediate sized pumping applications, filling the gap between small hand pumps and large engine-powe red systems and increasingly replacing mech anical wind pumpers. In water pumping applications, water pumped during periods of sunshine can be stored in a tank for future use, making the use of batteries often unnecessary. A schematic of a water pumping system is shown in Figure 4. PV water pumping systems are relatively simple, require little maintenance, and provide independence from fossil fuels. They are often the system of choice for locations far from the utility grid (e.g. ranches) or for settings where the grid is non-existent and water resources scarce (e.g. developing countries). There is also a good synergy between irrigation and PV water pumping as the water requirements by the plants and the solar availability match (e.g. during the “rainy season” less sun is available, but less irrigation and water pumping is required).